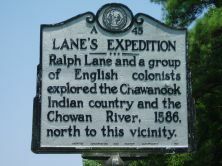 Ralph Lane and a group of English colonists explored the Chawanook Indian country and the Chowan River, 1586, north to this vicinity. Sir Ralph Lane of Devonshire, England entered into the service of Queen Elizabeth I in 1563. After serving as a courtier, soldier, and sheriff, he was invited by Sir Walter Raleigh to command an expedition to America. On April 9, 1585 he sailed with 107 colonists to America under Sir Richard Grenville. By the end of June they had arrived at Wococon, what is now Ocracoke, on the Outer Banks. A colony was established there with Lane as the governor. While there, they encountered native people belonging to the villages of Weapemeoc, Roanac, Pomeiok, Aquascogoc, and Secotan. After Grenville left for England, the colony moved to Roanoke Island and established Fort Raleigh. Lane thought that a better harbor was necessary and sent colonists to explore the potential of the Chesapeake Bay area. The hostility of Indians and shortage of supplies prevented a move to that region. 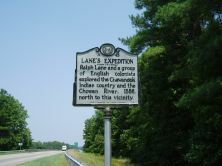 In 1586, Lane and a group of colonists explored the Chawanook Indian country and the Chowan River. Thomas Harriot, a mathematician and scientist, and John White, an artist, were members of the expedition. Raleigh had sent Harriot to study the native inhabitants as well as to explore the region’s plants, animals, and minerals. White was hired to make maps and paint watercolors of the region. Their findings were preserved in their book, A Briefe and true report of the new found land of Virginia. By June of 1586, the colony’s supplies were running short and Grenville’s relief expedition had not yet arrived. Sir Francis Drake arrived on June 11 and offered Lane a ship and enough supplies to last through the summer. The ship however was destroyed by a hurricane; the discouraged Lane and other colonists abandoned the colony and boarded Drake’s ships to immediately return to England. Lane was criticized for abandoning the colony especially since Grenville’s relief squadron arrived shortly after they left the colony for England. Lane never returned to America but moved to Ireland to assume the post of muster-master general and clerk of the check. On October 14, 1593 he was knighted by the lord deputy of Ireland, Sir William Fitzwilliam. He died in Ireland in October of 1603.